“Chanticleer and the Fox”, an adaptation from The Canterbury Tales, and illustrated by Barbara Cooney, received the 1959 Caldecott Medal. 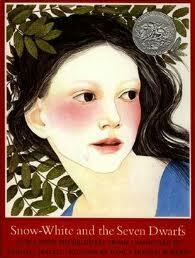 This charming book reminded my children of some of the many Aesop’s Fables that they have heard. I particularly enjoyed that the wit and wisdom of the story’s rooster triumphed over the sly fox. “Excellence of execution in the artistic technique employed.” – Pictures in primarily black and white with occasional accents in red, green, blue, yellow, and brown allow for eye-catching illustrations. Extensive details are evident, my favorite of which are the thatching on the roof and the bee hives in one scene. “Excellence of pictorial interpretation of story, theme, or concept.” – The story can be followed easily through the pictures. “Appropriateness of style of illustration to the story, theme or concept.”– The illustrative style used in this book elicits the “Old World” setting of Chaucer and the prototypical Aesop-like fable. “Delineation of plot, theme, characters, setting, mood or information through the pictures.” – The plot, characters, setting, and information are very clear throughout the book. “Excellence of presentation in recognition of a child audience.”– My children enjoyed this book, but I believe it was more for the charm of the story than for the pictures. Details in the illustrations, however, could be used to discuss many aspects of farm life. 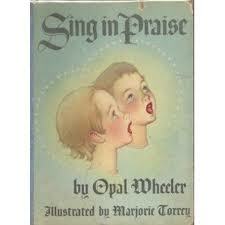 Sing in Praise, a collection of 25 hymns and accompanying stories written by Opal Wheeler and illustrated by Marjorie Torrey, received a Caldecott Honor award in 1947. This lesser-known book was difficult to find, even with interlibrary loan services. Each story is in some way related to the writing of the hymn, its author, or the meaning of the words. 1. “Excellence of execution in the artistic technique employed.” – These lovely, old-fashioned pictures, some in watercolors and some pencil sketches, have clear lines and a relaxing quality. 2. “Excellence of pictorial interpretation of story, theme, or concept.” – Each hymn has its own illustration relating in some way to the theme of the song. 3. “Appropriateness of style of illustration to the story, theme or concept.”– These old-fashioned illustrations this seem appropriate, as all of these beloved Christian songs have been sung by congregations for over a century. 4. “Delineation of plot, theme, characters, setting, mood or information through the pictures.” – There is no ongoing plot, but the theme of each hymn does relate in some way to each picture. 5. “Excellence of presentation in recognition of a child audience.” – While these are lovely pictures, I believe that modern-day children may find many of them difficult to relate to in the world with which they are familiar. Bonny’s Big Day by James Herriot colorfully tells the story of a work horse who has long been retired and left to graze in a pasture. When the veterinarian-author visits the farm, he suggests to the disheveled owner that he enter the well-loved horse into the pet show at an upcoming fair. The older man resists, insisting that the large animal is not a pet, but shows up at the event with the amazing horse well-groomed and decorated. After being judged against many smaller, adorable animals, the magnificent horse is awarded first prize then returned to her grassy home to live out her days. Pros: A gentle-reading story that can help children to see that people and animals may be diamonds in the rough. Cons: If you don’t have and don’t want a pet, I wouldn’t read this book to a child, as this book will encourage them to desire an animal to love. Did they really read these books to young children in 1939? Even for this day and age, when young eyes regulary encounter more violence, I find this book a bit over-the-top with graphic details. Snow-White and the Seven Dwarfs – A Tale from the Brothers Grimm, translated by Randall Jarrell and pictures by Nancy Ekholm Burkert, was not a book I would have just picked out on a whim,and it is not a book I would regularly recommend or even have usually read to my children. The story is a bit more complex than the usual telling, as the queen must try 3 times to kill Snow-White. I did find that this book explained some of my ever-nagging questions about this story, such as how Snow-Whitecould have “come back to life” after being in a casket for so long. With words only on facing pages and pictures only in alternating pages, I found this book a bit visually frustrating as I read the story and there were no pictures to look at then there were pictures, but no words. The pictures were okay, but not what I would call spectacular. 1. “Excellence of execution in the artistic technique employed.” – The water-color-type illustrations are good quality. 2. “Excellence of pictorial interpretation of story, theme, or concept.” – Yes, the darkness of the story is evident through the illustrations. 3. “Appropriateness of style of illustration to the story, theme or concept.” – Yes, you could feel as if you were in a late-medieval time period. 4. “Delineation of plot, theme, characters, setting, mood or information through the pictures.” – I would agree with this somewhat, but certain parts of the story were left to the imagination visually. 5. “Excellence of presentation in recognition of a child audience.” – I believe that these illustrations could easily be lost on young children. The symbols for potions and other parts of the story are not easily understood.